. 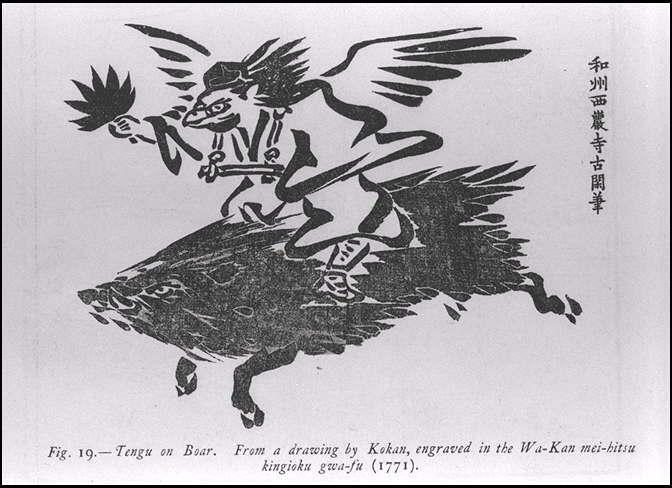 Tengu 烏天狗騎猪 Karasu Tengu riding on a wild boar . Late Edo Period Painting by Kaihō Yūtoku, Sairin-ji Temple 西林寺, Kyoto. 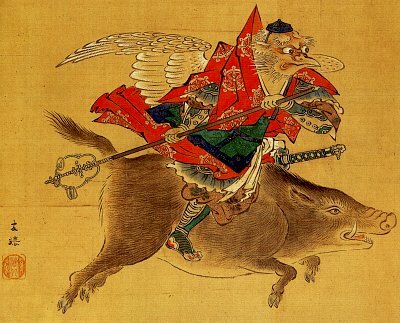 In paintings and woodblock prints, the boar often appears as the steed of the tengu or of their king, Sōjōbō 僧正坊. Sōjōbō is closely linked to famed warrior Minamoto no Yoshitsune 源義経 (1159-1189), one of Japan's most revered samurai. 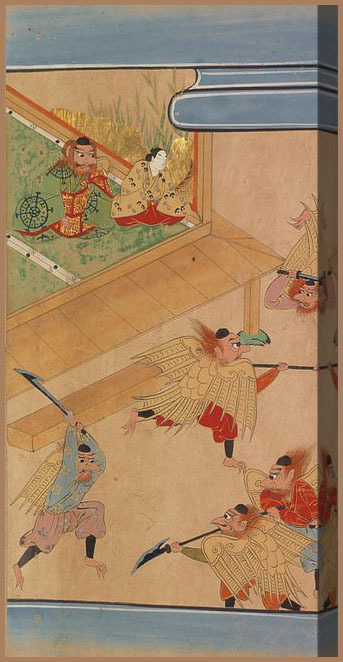 In a well-known legend, Yoshitsune lived among the tengu in his youth and received training in the arts of war from Sōjōbō himself. The Buddhist martial deity Marishiten is also often shown riding atop a boar. “One day a hunter was in the mountains when he happened to see a snake killing a bird. Suddenly a boar appeared and began to devour the snake. The hunter thought he should kill the boar, but changed his mind because he did not want to be a link in such a chain, and cause his own death by the next predator to come along. On his way home he heard a voice call to him from the top of a tree. It was the voice of a tengu. It told him how lucky he was, for had he killed the boar, the tengu would have killed him. and his messenger, the inoshishi 猪 / 猪 wild boar . 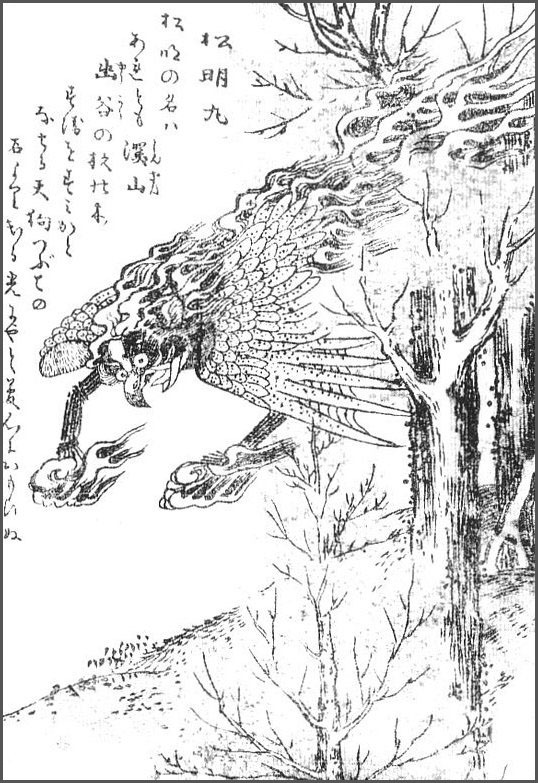 Yamanokami is sometimes seen as a Tengu. There are some Tengu living close by. 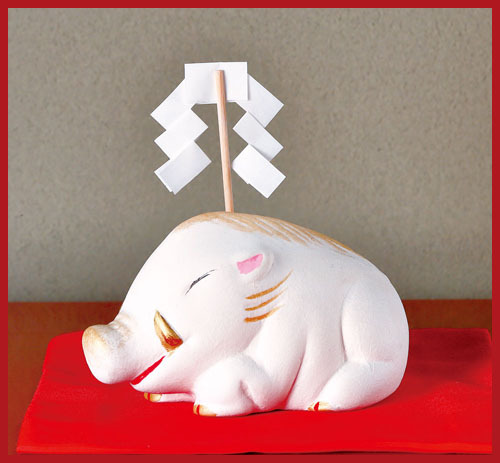 An old legend tells the story of the deity Iwahashi Myojin cultivating rice with the help of a wild boar. An alternative theory finds the word to have its origin in the language of the Ainu people, but in any case it points to a deep connection with the cultivation of rice. Present day Inawashiro owes its form to a large-scale eruption of the Mt. Bandai and Mt. Nekoma volcanoes that occurred between 40,000 and 50,000 years ago. 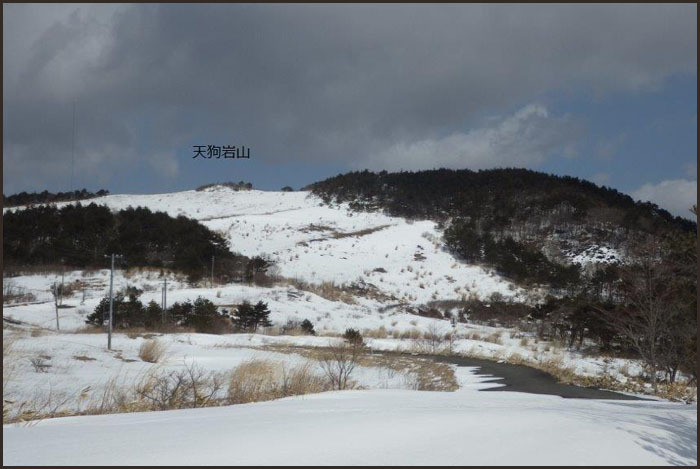 There are also indications that the area around Lake Inawashiro was already inhabited by indigenous peoples 12,000 years ago. 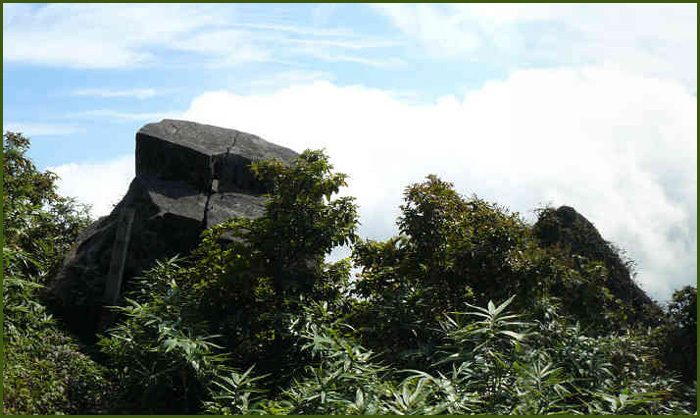 Especially in the southeast base area of the mountain facing the lake, ruins from the Jomon and Paleolithic/Pre-Jomon periods are still visible. The ruins that have been found in the bottom of the lake in the Nagahama, Kanisawahama and Sanjogata areas have been dated back to the Jomon and Kofun periods. The Shrine is famous for the 大鹿桜 Oshika-Zakura elk cherry tree, one of the five famous cherry trees in Aizu. A kind of サトザクラ Satozakura. Lake Inawashiro (猪苗代湖 Inawashiro-ko) is the fourth-largest lake in Japan, located in central Fukushima Prefecture, south of Mount Bandai. It is also known as the 'Heavenly Mirror Lake' (天鏡湖 Tenkyōko). The lake is located within the borders of Bandai-Asahi National Park. It is a surface area of 104 square kilometres (40 sq mi), circumference of 63 kilometres (39 mi), depth of 94 metres (308 ft) and is located at an altitude of 514 metres (1,686 ft). In winter swans migrate to the beaches of the lake and stay there until spring. was formed some 30-40,000 years ago when a tectonic depression was dammed by a major eruption and pyroclastic flow from Mount Bandai. The water is acidic with a pH value of approximately 5.0, and has a high degree of transparency. The water level was considerably less during the Jōmon period as numerous artifacts and ceramic fragments have been found offshore. 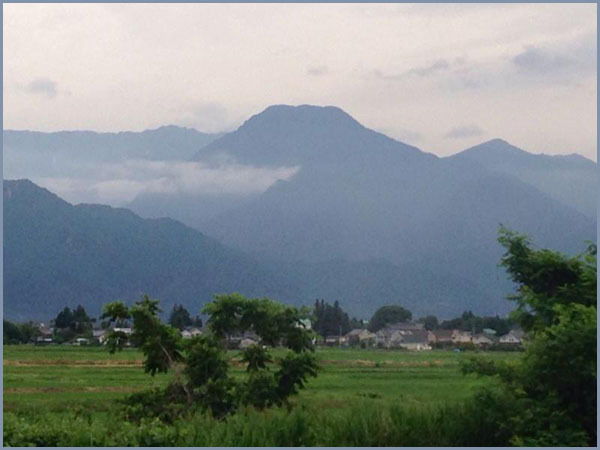 is an important source for irrigation in the Aizu region of western Fukushima Prefecture. 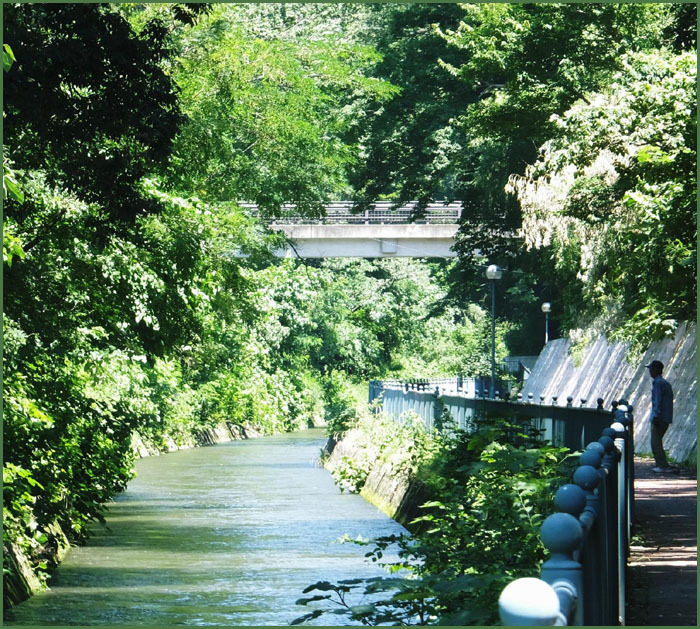 An irrigation canal was completed during the Edo period and another, the Asaka Canal, in 1882. A third canal completed in 1915 supplies the city of Kōriyama with drinking and industrial water. The water also supplies a number of hydroelectric power plants. The lake is also an important tourist and leisure attraction in Fukushima Prefecture. 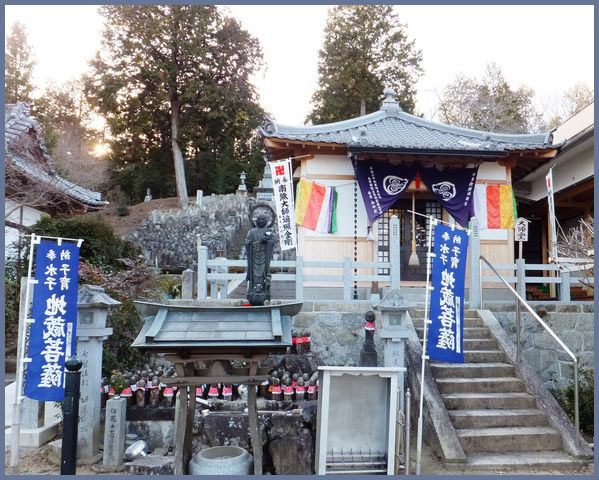 . . Atago Gongen and Atago Shrines 愛宕 / 阿多古. .
Tarobo from Atago was in fact a person called Shishido Saburoemon 宍戸三郎右衛門, who was a strong believer in the Atago deity. He is also responsible for making the 猪 wild boar a messenger of the deity. 猪田村 Idamura, Ida village, "field of the Wild Boar"
. Kotengu 小天狗 minor Tengu, crow-like goblin . The Shrine Ida Jinja (also known as 猪田村住吉神社 Sumiyoshi Jinja in Idamura), has been built by a Kotengu. Until WWII, there were also ema votive tablets of the Kotengu. In former times, the Kotengu from nearby mountains would also come for the festival, make merry and perform a lion dance. In Iga there was also a Kotengu called 小天狗清蔵 Seizo. 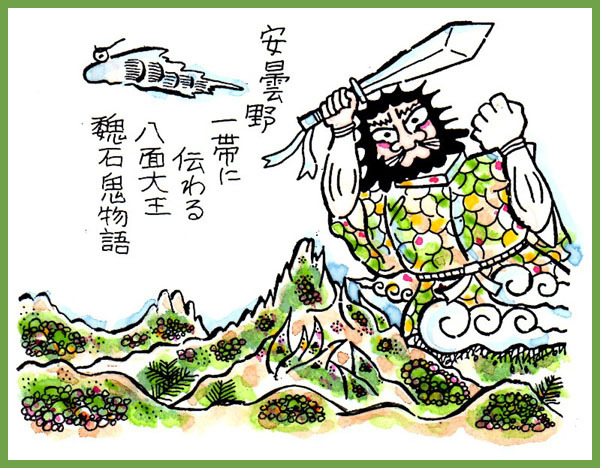 He helped to protect the local shrines and temples from the fury of the army of Oda Nobunaga. He also lived in the temple Shoin-Ji. At the temple 勝因寺 Shoin-Ji an old Kotengu used to live in hjding. He is said to have made 勝因寺梵鐘 the large temple bell, which is one of the oldest in Mie prefecture. 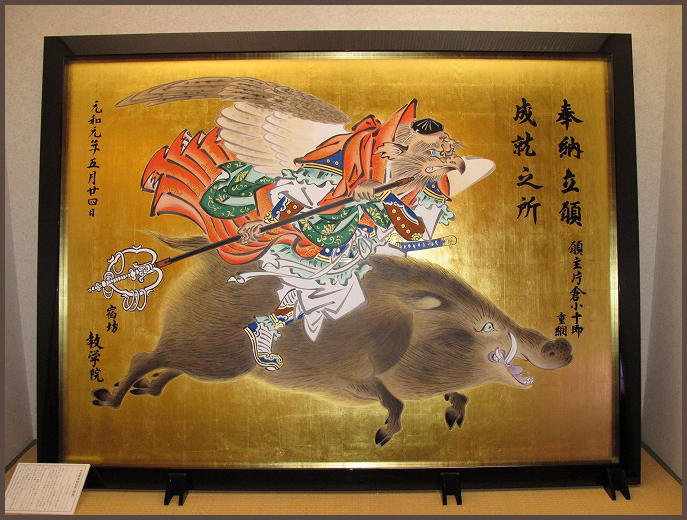 One night, the Tengu Deity appeared to him, placed a golden halberd and a golden Gohei wand in the ground and told him, if he made offerings of お神酒 ritual rice wine and お灯明 light, there would be no more damage of wild boars in his fields. Envious villagers tried to take away the halberd and Gohei from Ikuzo, but they had no good luck with it.
. gohei 御幣 ritual wand . there is the sound of someone singing a woodcutter song and the person will be lifted away into the sky. They say this is the doing of the local Tengu. 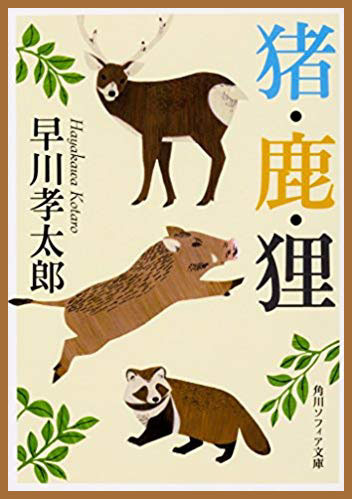 九十貫を超える巨猪を撃った狩人の話。Strange tales about wild boars, deer and Tanuki badgers. The Tengubi Yokai appears near or over water. Tengubi is a fireball phenomenon seen near rivers in Aichi, Shizuoka, Yamanashi, and Kanagawa Prefectures. It appears as one or more (up to several hundred) reddish flames which float about in the sky. 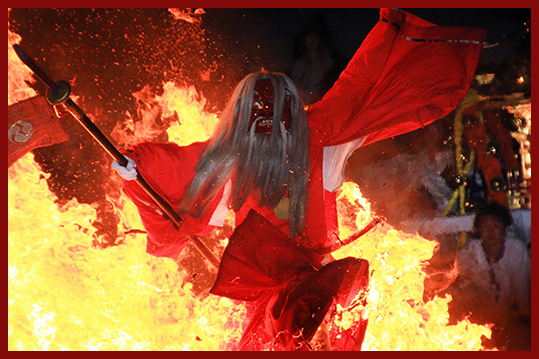 These supernatural fires are said to be created by tengu. Tengubi descends at night from the mountains to the rivers. Often it starts as a small number of fireballs which split into hundreds of smaller flames. These flames hover above the water for some time, as if dancing. Afterwards, they return to the mountains. In most cases, humans who witness tengubi invariably meet with disaster—usually in the form of a serious illness contracted shortly after the encounter. Because of this, locals who lives in areas where tengubi is common greatly fear this phenomenon. If a local happens to see a tengubi, they will immediately drop prone and hide. Oftentimes they will cover their heads with their shoes or sandals. Occasionally, tengubi can he helpful to humans. During times of drought, it was common for rice farmers to secretly steal water from their neighbors by redirecting water from the canals into their own fields during the night. This caused a great deal of conflict among the people involved. However, when tengubi appeared above the canals, would-be thieves were thwarted—either out of guilty consciences or because the light from the tengubi made it impossible to sneak around. Tengubi is created by kawa tengu—”river tengu” who prefer the riversides over the deep mountain valleys where tengu normally live. It is used by these tengu to catch fish at night. For this reason it is also known as tengu no gyorō (“tengu fishing”). included this phenomenon in his book Hyakki tsurezure bukuro under the name taimatsu maru (taimatsu meaning “torch,” and maru being a popular suffix for boys’ names). He described it not as a tool for tengu to help with fishing, but as a way for them to hinder and interfere with the religious practices of ascetic monks. Long ago, tengubi was frequently seen in the villages of Kasugai City, Aichi Prefecture. One night, a villager was caught out in the mountains in a sudden thunderstorm. It was cold, and too dark to find his way back home, so he took shelter under a tree and shivered. Before long, mysterious fires began appearing around him. Not only did they warm his chilled body up, but they provided enough light for him to find the road and make it safely back to his village. It was a common superstition in that village not to go outside of your home on nights when tengubi appeared. If you did, it was said that you would be spirited away into the mountains. One night a particularly foolhardy young man defied the superstition. He walked out of his house, faced the tengubi, and called out, “If you can take me, come and get me!” Suddenly, a large black shape appeared out of nowhere and grabbed the young man. It picked him up and flew away into the mountains. The young man was never seen again. Taimatsumaru is a Japanese Yokai monster folklore illustrated in a book "Hyakki Tsurezure Bukuro" written by Sekien Toriyama in 1784. 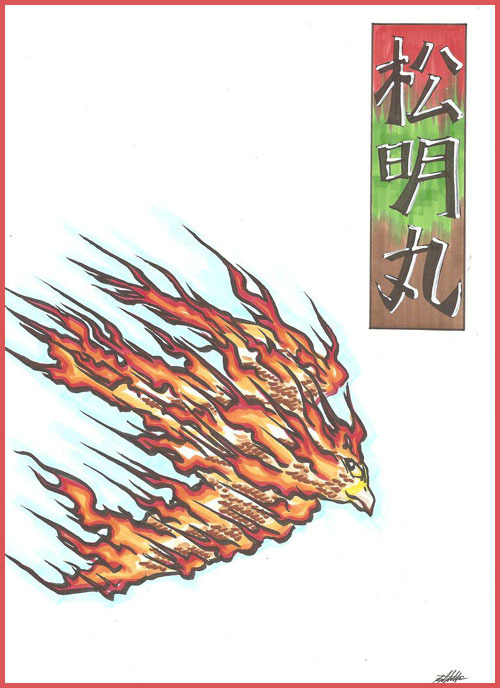 Teimatsumaru is a kind of Tengubi fire that Tengu creates. It look like a Raptores in fire. It appears in deep forest. It disturbs training monks in the mountain. If people happen to see a "Tengu fire", they throw their geta 下駄 wooden sandals or zoori 草履 straw sandals to make it go away. 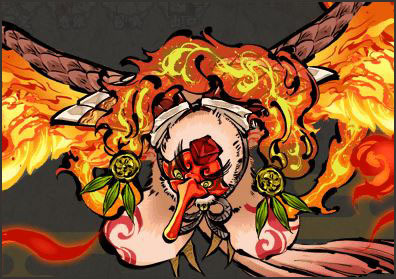 If a child plays with fire, a Tengu will find out and then put the whole house on fire. Such a fire, caused by a Tengu, can not be extinguished. 天狗の火鳥が歩く A Tengu firebird is walking. If people see a red fire on the open sea, this is a caused by a Tengu. If they see a smaller, bluish fire, this is caused by s spider.
. kumo 蜘蛛と伝説 Legends about spiders / Spinnen . If a fisherman sees a Tengubi and calls "Oi, oi オイオイ come here, come here!" the ball of fire will come closer. Tengu no Hi as a messenger of 秋葉山 Mount Akibayama and Mount 光明山 Komyosan.
. 秋葉山 Akibayama, Akiba Yama, a Tengu Mountain . In the summer of 1970, a man saw a Tengu fire. It looked like 20 or 30 lampions hanging over the mountain ridge and seemed to climb upwards all the time. There was no sound of feet walking or people talking. It is often seen on the mountain ridges, like blinking lanterns. Often seen on the pass between 佐久間町の草木と西浦の間 Kusaki village and Nishiura village. Tengubi is an expression of the supernatural power of a Tengu. Of those who do, not many pay the mountain much regard. And, although the ridgeways between Yari-ga-take and Tsubakuro may be crowded enough to qualify as an Alpine “Ginza”, fewer still pay much attention to Ariake-yama even when they find it rearing up at them on their way to the foot of Tsubakuro. Rather, their eyes are drawn to the more imposing heights beyond. Ariake, it seems, has been consigned to the meizan of past ages. According to an old chronicle, the mountain was opened in the second year of Daidō (807), when the great avatar Tohanachi Gongen was enshrined there at a place sacred to Ame-no-Uzume, where this goddess of dawn, mirth and revelry had manifested herself as a Buddha to save all living things. 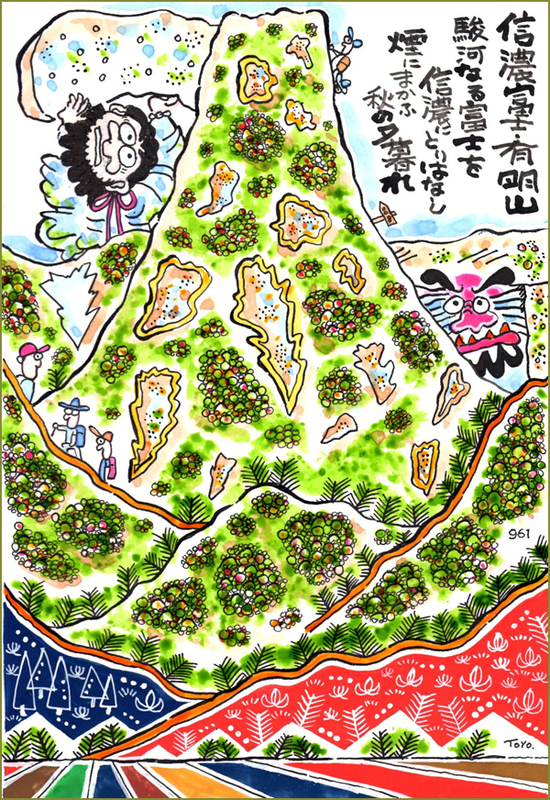 The mountain was once called Tohanachi-dake or “Door Away Peak”, in honour of the legend in which the sun goddess Amaterasu shut herself up in a cave and was coaxed out again when the goddess Ame-no-Uzume performed a comical dance. At which the god Tajikarawo-no-mikoto wrenched away the cave’s door and hurled it to earth at this very spot. I came across this chronicle, the Record of Ariake’s Inauguration (Ariake Kaizan Ryakki), in Mr Kumahara Masao’s book on the dawn of Japanese mountaineering. By this account, the mountain mystic Yūkai, finding it lamentable that people had altogether given up climbing this sacred mountain, set out with his youngest brother in the sixth year of Kyōho (1721) together with fifteen or so villagers from the hamlet of Itadori at the mountain’s foot, and found his way over trackless slopes to the summit. There they stayed overnight and descended the next day. 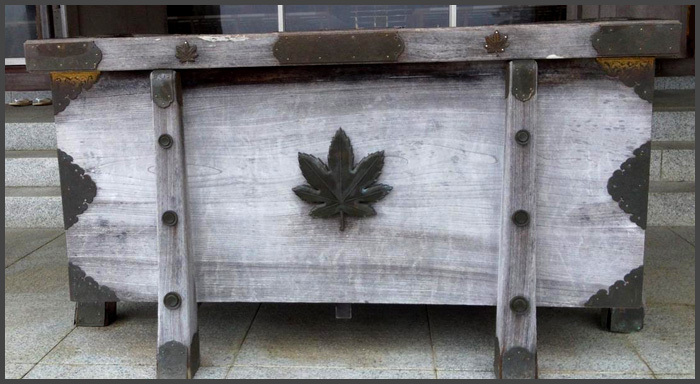 For evidence that this custom lasted into the Meiji period, we need look no further than Walter Weston, the mountaineering missionary and so-called Father of the Japan Alps, who climbed Ariake on August 14, 1912, in the first year of Taishō. Presumably he’d heard of Ariake’s reputation as a “meizan” of long standing. 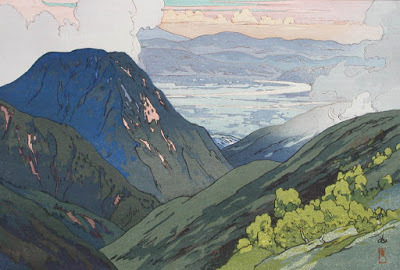 Most people associate Weston with Mountaineering and Exploration in the Japanese Alps (1896), and rather fewer are aware of his later book, The Playground of the Far East (1918), which also concerns itself mainly with the mountains of Japan. This is probably because there is no translation. It is in this later book that he describes his ascent of Ariake. And then it’s easy to understand how Ariake came by its title of Shinano-Fuji. This is a story about the young Minamoto no Yoshitsune, who is taken on a tour of the underworld by a Tengu from Mount Kurama. Written in the Muromachi period. This story exists in numerous lavish picture scrolls and woodblock-printed editions in libraries and museums around the world. 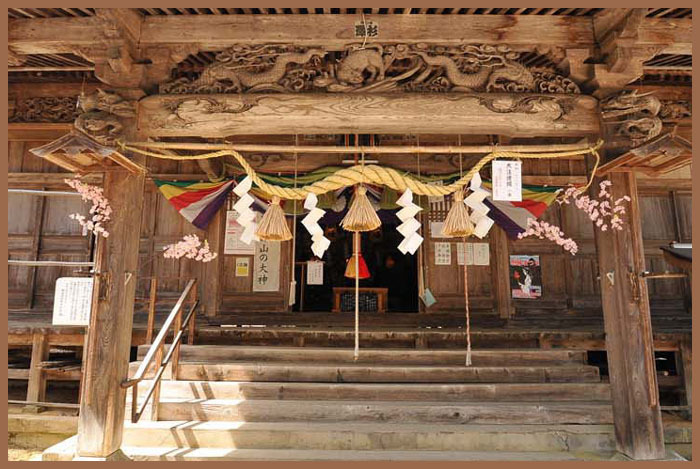 In this story, Ushiwaka learns of the existence of a tengu palace deep in the mountains and by offering prayers to Bishamon succeeds in visiting it. 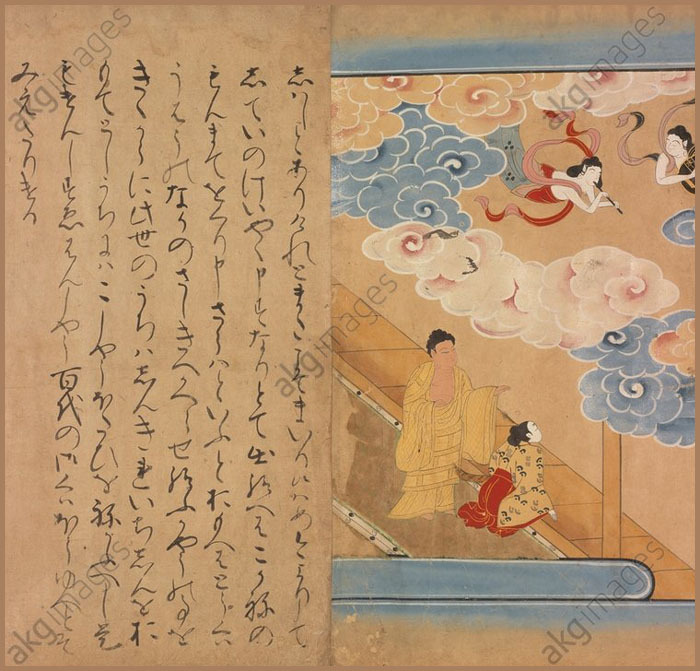 The Great Tengu welcomes him hospitably and offers to take him to see Yoshitomo (his father), who has been reborn in the Pure Land as a Buddha. Following a tour of the 136 Buddhist hells, the two finally reached the Pure Land. Yoshitomo urges Ushiwaka to destroy the Heike and then predicts his future. and Ushiwaka returns to Kurama. 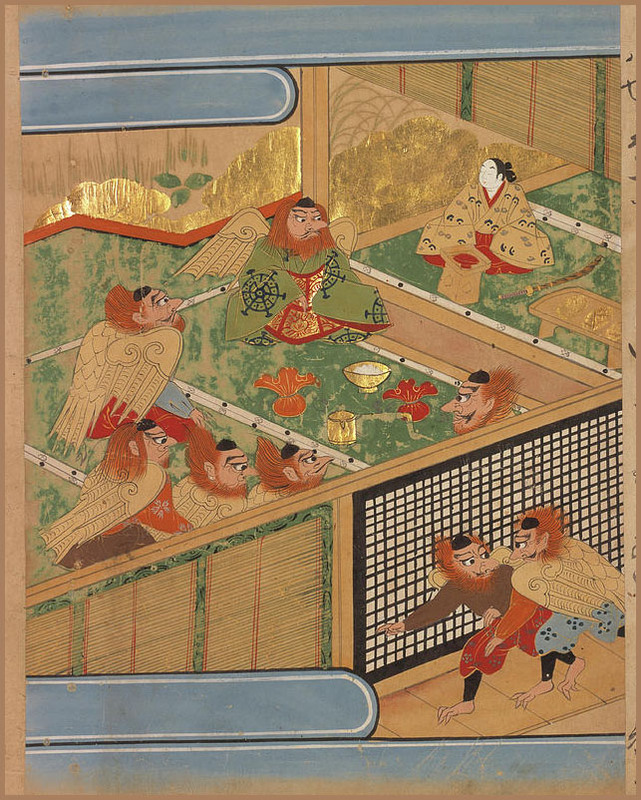 and of his visit to the court of Tengu.
. The Tengu Sōjōbō 僧正坊 from Mount Kurama .
. zeni, kozeni 銭、小銭 coins of Edo .
. saisen 賽銭 money offerings at a Shrine .
. sentoo 銭湯 Sento, public bath . 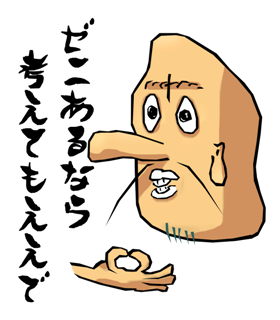 There is a rock named nusutto ishi 盗っ人石 (盗人石 / 盗人岩) "thief's rock". 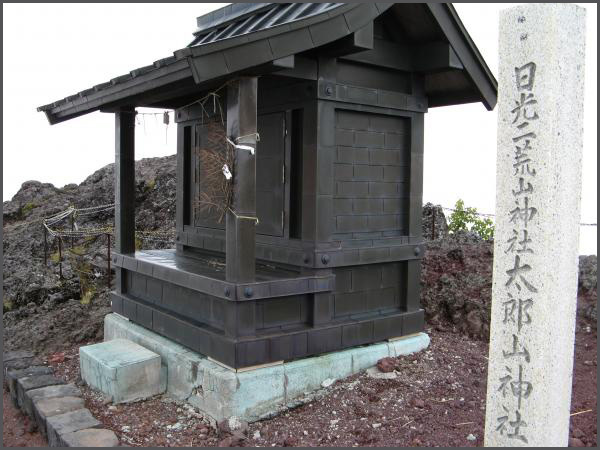 Once a thief stole the money offerings from the shrine at 石鎚山 Mount Ishizuchisan. But he was caught by the Tengu from the mountain, who threw him high in the sky. 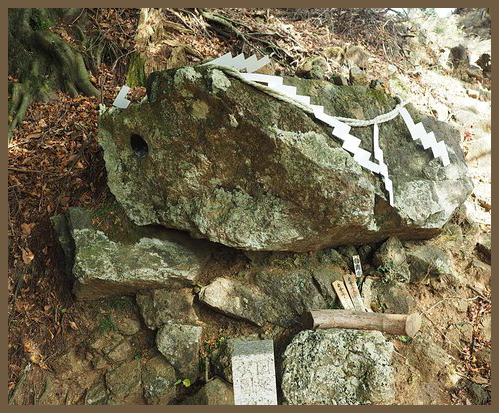 The stone is where the thief landed.
. Mount Ichizuchiyama, Ishizuchisan 石鎚山 1982 m.
Once a man went to the local shrine and made a wish, but did not give any money offerings. So the Tengu came after him and his house burned down. At the shrine 太郎山神社 Tarosan Jinja, during the annual festival, there was a farmer who took some of the money offerings home. But when he reached his house, he found his rice storage house all empty. So he run back to the shrine and put the money in the offering box. 栃木県日光市の男体山にある神社. This Tarosan Jinja is in Nikko at Mount Nantaisan. The local Tengu lives in the Tengu Matsu 天狗松 Tengu Pine. If people have a wish for getting healed or are in need of money, they place a note on this tree. Around 1715, there lived a rich merchant in 江戸神田鍋町 Kanda Nabe Cho. 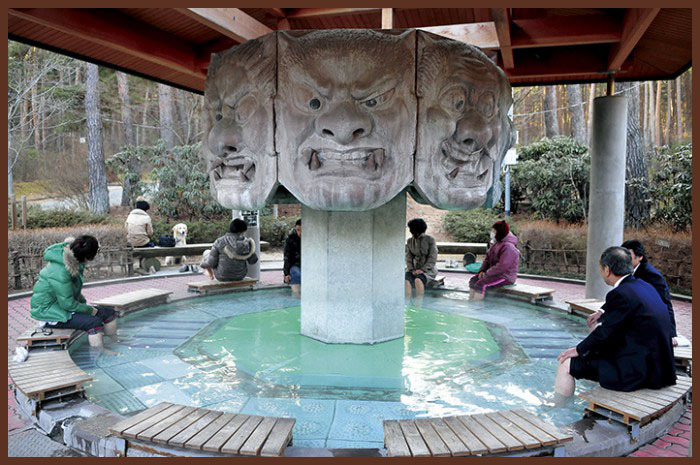 One of his servants went out to the public bath on the 15th day of the New Year. But soon someone saw him coming out at the back door, in traveling robes. Investigating further, they found the man had been travelling since the 13th day of the 12th lunar month of the year before. So someone, maybe the local Tengu, must have acted in his place. A similar story as told in Chiyoda ward. The wandering servant even brought back presents from his trip. Once a man came walking down ヒナタ峰 Mount Hinata Mine when a coin with a hole came falling down from a pine tree. This mus be a trick of the Tengu, he thought. He said out loud: "I will take this home and keep in venerated as a special amulet! ", but he could not lift if from the ground. Once a man faced a financial problem near a place called Zenibatake ゼニバタケ / 銭畑 "Field of Zeni coins" in front of the Tengu-Iwa. Suddenly a Tengu appeared and spread a lot of zeni out for him. 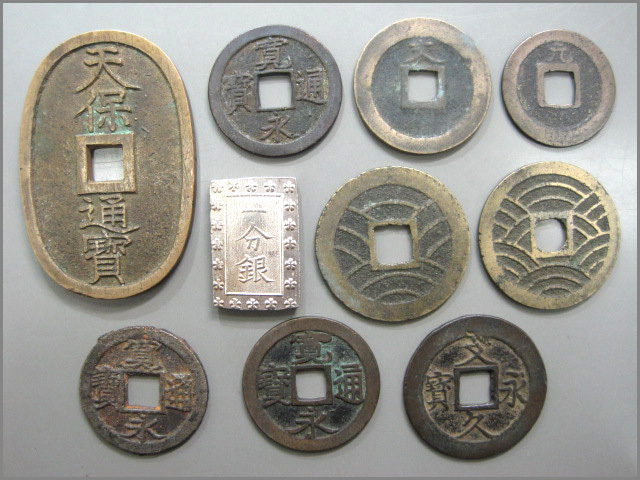 At Mount サワオキ Sawaoki, where nobody lived, they found 中国銭 Chinese coins. They say once upon a time a Tengu had lived here. ..... the tengu-ishi (falling stones or pebbles), also have the character of a sudden event in the solitude of the mountains or forests. The main point of the inauspicious activities of the medieval tengu may be described as anti-Buddhism.
. Tenguiwa, Tengu-Iwa 天狗岩 "Tengu rock" . When they were digging a canal for 月ヶ瀬用水 the Tsukigase Waterway, a Tengu came and disturbed them, throwing stones. 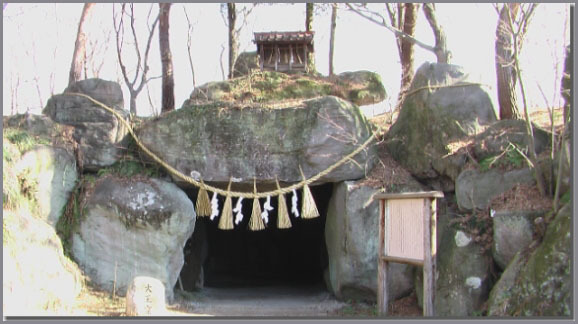 One of the workers went to Shikoku to pray at Konpira san and after that, the Tengu did not show up any more. 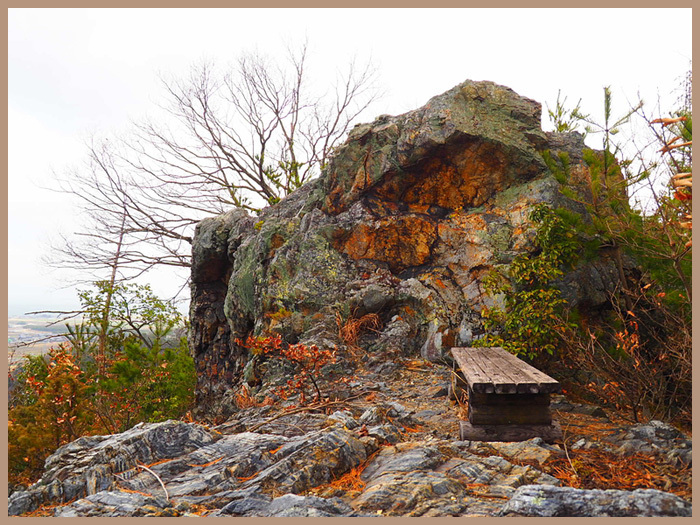 One of the rocks along the Waterway is called Tengu Iwa 天狗岩 "Tengu Rock".
. Yama no Kami 山の神 God of the Mountain and Tengu legends . Below the Tengu-Iwa there is a 天狗堂 Tengu Hall on the mountain road. There are a lot of tama-ishi 玉石 cobble stones. The villagers say they have been thrown from the opposite mountain by another Tengu during a fight. O-Degu Sama (Tengu Sama) is a male deity. Once he played with a woman on the other side of the river, throwing pebbles at each other. These are the Tengu Ishi. They sometimes fall down from the mountain even in our time. In 1604, 秋元長朝 Akimoto Nagatomo started the 越中堀 Etchubori canal . In 1610, 伊那忠次 / 伊奈 忠次 Ina Tadatsugu (1550 – 1610) built the 代官堀 Daikanbori canal. 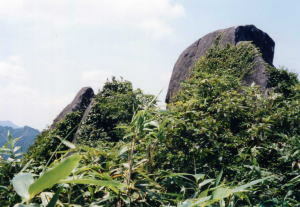 During the construction of the Etchubori, there was a huge boulder blocking the way. 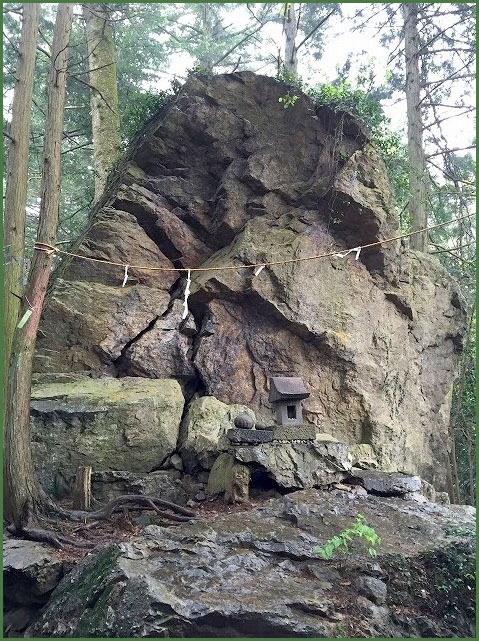 There came a Yamabushi mountain priest (a Tengu) and offered some prayers - now the boulder could be removed. Thanks to the canals the Akimoto clan could extend its fields and agriculture land. erected a memorial stone, 力田遺愛碑 Ryokudeniai no hi. Later in the Meiji period, the fifth hydroelectric power plant in Japan was built here. A hunter had been bewitched by a Tengu and made grappling with the root of a tree the whole night. Mount Hotakayama 武尊山 is a place where the Tengu live and where the Shugendo priests have a training area. There are sanctuaries for 大天狗、小天狗の祠 the Big and Small Tengu, a 天狗屋根 Tengu Yane and a Tengu-Iwa.
. Tenguiwa, Tengu-Iwa 天狗岩 "Tengu rock" - Photo - . If the Tengu comes to sit on the Tengu-Iwa and hit his drum, there will be fine weather in the coming year. there lived a Tengu. When the Tengu died, the mountain got its name. On its top is a huge boulder. If it falls down one day, it will be back in its position the next morning. The mountain is used as farmland up to about 720 m.
Dear Tabby, Oh, Dear Tabby, It is all by virtue of the read beans rice.
. Tengu no kamikakushi 天狗と神かくし kidnapped, abduction . A child that had been missing for a while was heard crying on the mountain on the other side of the valley. It must have been abducted by a Tengu. On the mountain near 舟原 Funabara there is a Tengu Ishi. It has a small hole where the Tengu 伯耆坊 Hokibo once stuck his nose in. Once upon a time, a man had gotten secret teachings from a Tengu and could perform various rituals and spells. At a festival, he exchanged questions and answers with a Tengu for a long time, but the other villagers could not hear or see a thing. Later they named the spot Tengu-Iwa and came to celebrate there once a year. Once upon a very long time, the Tengu frequently came to take a rest on the Tenguiwa. Once upon a time, a Tengu had come all the way from 岩木山 Mount Iwakisan in Aomori, but by mistake he hurt his eye at the 杉 pine tree. 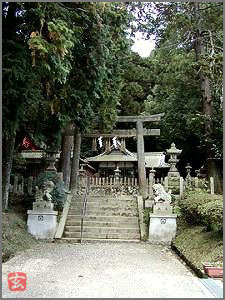 The Tengu cut down the tree and placed a huge stone in its place, this is now the Tenguishi, Tengu Ishi 天狗石 Tengo stone. Once Nobutaro went with a friend to 有明山 Mount Ariakeyama. When they tried to jump over the Tenguiwa, their bodies became an enormous in size and they jumped over 馬羅尾谷 Baraodani valley and disappeared. Ariakeyama is also called Shino Fuji 信濃富士 Mount Fuji of the Shino region.
. Ariakeyama 有明山 Ariakesan, Mount Ariake . 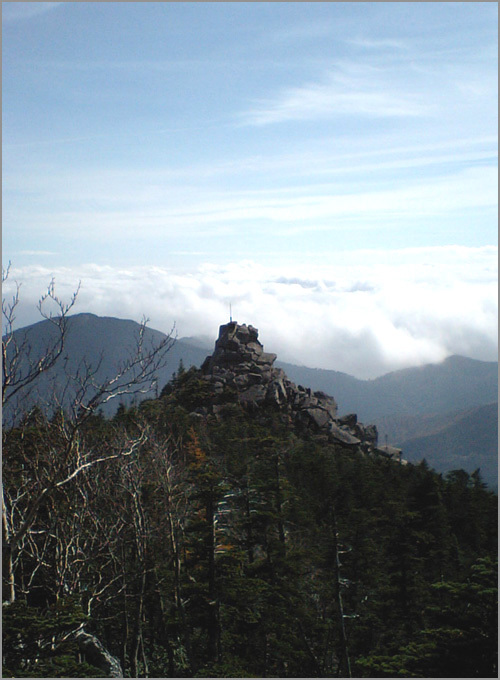 On top of 高社山 Mount Koshasan (1,352 m) there is a 天狗岩 Tengu Iwa. Locates in the Eastern part of the mountain range, this peak is seldom climbed by mountaineers. There are a few waterfalls on the way up. Many Tengu came together at the top of this boulder. On orders of the deity 立科明神 Tateshina Myojin to figure out the 善悪 good and evil in this world. In 大和 Yamato at Kami-Suwa there is a Tengu Stone. They say it looks just like a Tengu face, hence the name. Others say once a Tengu had come down here to take a rest. The Tengu from 大山 Mount Daisen sometimes comes here to rest his wings. In winter people can here a strange sound of flapping wings and there will be snow the next day.
. Tengu-daoshi, Tengu daoshi 天狗倒し "Tengu knocking down trees" .
. Tenguiwa, Tengu-Iwa 天狗岩 "Tengu boulder" . There was a Tengu Boulder near the waterfall 七代の滝 Nanayo no Taki, where a Tengu lived. Once a priest from the nearby temple used it to pee. If the visitors in his temple wanted to eat Tofu from Tokoy, the Tengu went off to fetch it in no time. 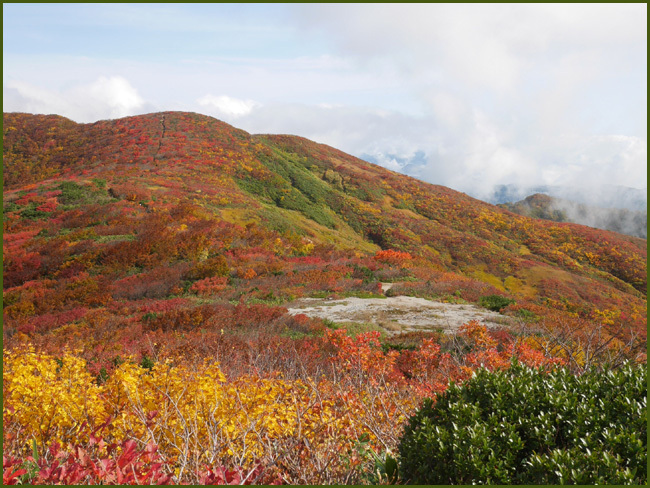 Mount Kokushidake is 2591 m high. In a place called 平洞 Hedo in the middle of the mountain there is a matsu 松 pine tree, where the Tengu comes to rest. There is also a Tengu-Iwa nearby. 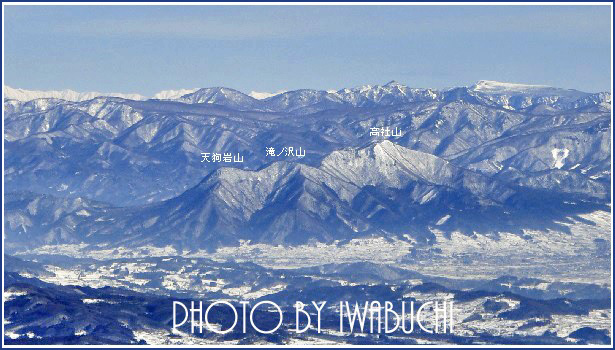 - There are other mountains with this name in Japan. There is a Tengu-Iwa where a Tengu lives and parents tell their children, if they do not behave, the Tengu will come and get them. A man was making charcoal near the Tengu-Iwa. Suddenly he heard a loud noise, like flutes and drums for a festival. But he could not see anybody. This was the doing of the local Tengu.
. geta 下駄　ashida 足駄 Geta wooden clogs and legends .
. Tengu to zeni 天狗と銭 Legends about Tengu and coins . On the 10th day of the first lunar month, many Tengu gather at Mount Tengusumotoriyama to have a contest. There is a mountain called 二ッ石山 Futatsuishiyama "Mountain with two stones", where once two 天狗石 Tengu-Ishi had been. Mountain where Tengu practise Sumo wrestling . In 名之内 Myonouchi there are two rocks called Tengu-Iwa. The Tengu come here to rest.